I have never read Miracleman before the current Marvel comics reprints. I will be here to give you my impressions as a first time reader. I found I enjoyed the second issue of the Golden Age story much more than the first. Once again we see things from a nameless narrator’s point of view. The narrator this time is a man who maintains an old windmill in a wind power farm. One night during a storm Miraclewoman flew by and he said he loved her and she heard him and came down. After that Miraclewoman begins having a sort of casual affair with the narrator because apparently that is something she does. 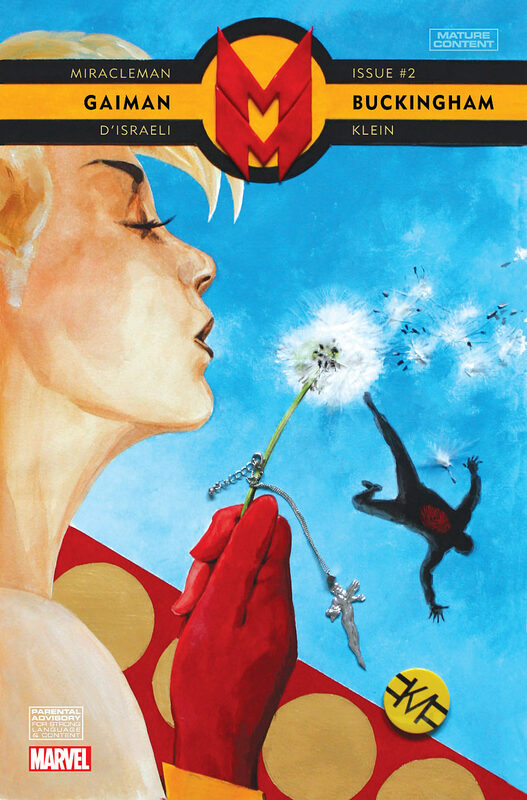 Meanwhile has fantasies of her leaving Miracleman to be with him. As the story goes we get a clearer picture of what kind of man the narrator is. He has had many past relationships and seems to have ended them all for rather shallow reasons. If he could not be with a “perfect” woman he did not want to bother at all. One night Miraclewoman asks him about it, turns out she checked up on her occasional lover. She brings up the idea that all women are goddesses and all men are gods, more on that later. She also points out that just because she has perfect features that is not necessarily what makes beauty. She then transforms back to her human body. Here we see that Miraclewoman recognizes that there is not real difference between her human and superhuman selves, they are both her. She has one last night with the narrator as her regular self and then leaves never to return. The narrator finds her fingerprint scorched into his back so that he knows it was all real. Afterwards the narrator reconnects with one of his old relationships and posts his story on their version of the internet in case anyone wants to visit him and hear about it firsthand. The part of this story that really interests me is Miraclewoman’s statement about all men and women being gods and goddesses. This may be part of the philosophy that Miracleman and his pantheon teach but a lot of their actions seem to directly contradict it. If everyone is a god then why do the Miracles set themselves so far apart from humanity up on Olympus? Their cannon may be everyone can be a god but they certainly don’t seem to be treating people that way. Next there is a back up story called Trends about the cult that has risen up around the memory of Kid Miracleman. It involves a girl talking to a boy who happens to be on of the Bates, a Kid Miracleman worshiper. The boy accuses the girl of asking about it because its trendy and asserts that the Bates are not just a trend. Eventually the boy shows the girl his pendant of Kid Miraclmean complete with metal beam through the chest and concrete chunk in the head. The characters are drawn in an exaggerated cartoony style like a newspaper comic strip. It seems there are some details about Kid Miracleman’s that are not publicly known because the Bates think he is going to return one day. With this story we see that by elevating themselves to divine status the Miracles have done the same for their fallen enemy. We also see that many people are still coping with the trauma that Kid Miracleman inflicted on the world. I am guessing the rest of this arc will follow a formula of having each issue focus on a different aspect or character of the Miracle pantheon and mythology. So far we have had Miracleman and Miraclewoman, I wonder who will be next.